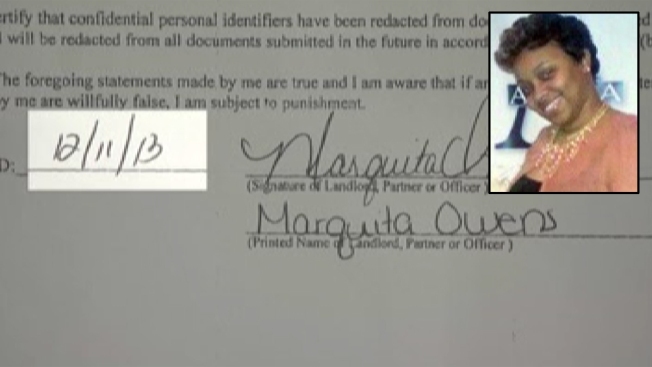 A number of tenants at a Newark apartment tower who received eviction notices in recent months noticed something peculiar on the official documents: the signature of a building manager who died four months prior to the date the forms were issued. “That was very weird to me. How can you use a deceased person’s signature?” said Kyle Screen, the Tenants Association President at the Pavilion apartment building on Dr. Martin Luther King Jr. Boulevard. Screen’s eviction notice was signed by Marquita Owens, a 29-year-old property manager who died of a sudden heart attack Aug. 21. Her signature on the court paperwork was dated nearly four months later, on Dec. 11. Kettler Management, the company running day-to-day operations at the Pavilion, admits a mistake was made. “It was a mistake and we regretted it,” said Cindy Clare, the company's president. Employees at the Pavilion often prepared eviction notices long before sending them out and Owens died after signing several undated forms, Clare said. The management company did not say who added the dates to the forms. “They pre-signed the form and then the date was added," Clare said. "As soon as it was brought to our attention we corrected it." Owens’ mother, Margaret Owens-Nelson, told the I-Team she is more than upset with Kettler Management and its handling of the error. “If you have an employee who has passed away, the signatures should no longer be used,” Owens-Nelson said. After tenants complained about the eviction notices, New Jersey regulators opened an investigation into leasing practices by Kettler and other entities that rent out apartments in the building. “The New Jersey Real Estate Commission is investigating reports of suspected unlicensed activity,” said Marshall McKnight, a spokesman for the New Jersey Department of Banking. Marquita Owens was the building manager for a few weeks at the Pavilion before she died. Her mother said her daughter did not have a real estate license. “She went to real estate school, but she did not have a license. I know that for a fact,” Owens-Nelson said. A real estate license is required under state law for people who execute leases or conduct business on behalf of apartment buildings, McKnight said. Tasha Owens, an aunt of the deceased building manager, said hearing about her niece’s signature being used after her death was upsetting. Kettler Management said it has been trying to tighten regulatory compliance since taking over the building's operations in July. The firm is still going through with about 100 evictions for underpayment of rent, but new eviction notices are being drafted with a living employee’s signature. “I am sending my regrets to the family that this occurred,” said Clare.